Maroon 5 has been an American pop favorite for more than 15 years (if you count the O.G. band Kara’s Flowers, more than 20 years). From the band's breakthrough with the rock-tinged “Harder To Breathe,” to dance-inspired hits like “Makes Me Wonder” and the somber “She Will Be Love,” Maroon 5 has morphed into one of the most reliable hit-making groups on the planet, says Billboard. Before the group takes the stage here in Sacramento, lets celebrate the successes of the band — both old and new! 10. Maroon 5’s debut album, Songs About Jane was released in 2002. It reached No. 6 on the Billboard Hot 200 chart and became multi-platinum with several hit singles. 9. “She Will Be Loved” was released in July 2004. This breakout single was certified platinum in three countries, selling more than 3 million units in the U.S. alone. This song has become a part of pop-culture being featured in many TV shows like “The Sopranos” and “One Tree Hill” and movies like “The Last Song.” It peaked at No. 5 on the Hot 100 chart. 8. In 2005, the band won the “Best New Artist” Grammy and in the following year, won “Best Pop Performance by a Duo Group” for the vocals on “This Love". 7. Finding record-setting success, “Makes Me Wonder” was their first number-one hit, which broke Kelly Clarkson’s record for biggest jump to the top of the Billboard 200 chart when it leaped up from No. 64 to No. 1. It could definitely be considered the anthem of the year 2007. 6. Maroon 5’s second album was released in May 2007, which debuted at No. 2 on the Billboard 200 chart and sold over 429,000 copies! 5. “Moves Like Jagger”, a collaboration with Christina Aguilera was released in 2011. This was a pivotal moment in their career, venturing into dance/electro-pop from their traditional rock band vibes. 4. The new single, “One More Night” debuted at No. 42 on the Hot 100, then climbed to the No. 1 spot, staying on the chart for 42 weeks in 2012. 3. V was released in 2014; their fifth studio album. This album reunited the original band making them the best they’ve ever been. 2. 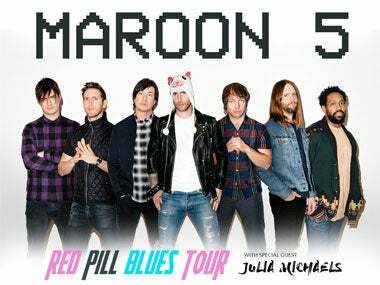 In 2017, Maroon 5 released their sixth studio album, Red Pill Blues. The album features many popular artists such as, Kendrick Lamar, SZA, Future, A$AP Rocky and Julia Michaels. This album debuted No. 2 on the Billboard 200. 1. In total, the band has produced 6 studio albums, won over 34 various music awards, has gone on tour 17 times (from opening to headlining), and has easily become one of the most successful musical groups in America! Maroon 5 has been an American classic band for many years. We are looking forward to the Red Pill Blues Tour right here to Sacramento in just one week! For more of their career highs, view "Maroon 5's Top 25 Career Moments: A Timeline" on Billboard.com!